The Ranger is a modern casual styled riding boot that provides fashionable support and optimum safety. With an urban inspired design, these on-trend motorcycle boots feature groundbreaking intelligent molecule technology and will easily pass as stylish mens dress boots, for those off-the-throttle occasions. Falco have taken their D-30™ molecule technology and added it to the ankle cup of the Ranger boot – this vastly increases rider safety in the event of an impact. A development birthed within and for the military, Falco’s D-30 technology employs intelligent molecules that flow freely while regular movement occurs. In the event of an abrupt force however, the molecules lock together to absorb the energy of impact and significantly reduce any force transmitted to the ankle or foot area. Keeping your feet securely glued to the ground or footpegs are the vintage stitched, hard wearing Vibram rubber soles. Specifically designed for motorcycle use, the Ranger’s heavy duty soles are an extremely durable and long lasting outer sole, resistant to oil and other lubricants that riders may encounter with long term use on road surfaces. Constructed from Premium grade, oil treated Italian Leather, the Ranger also features High-Tex™ membrane technology which will reject water penetration for optimal rider comfort in adverse weather conditions. The boot’s lace loop hide pocket is another user friendly feature that keeps laces free from tangling while riding, further optimising safety when on the roads. The side ankle zip with velcro tab also allows for quick and secure fastening of the boot, as well as easy removal, making the Ranger an indispensable motorcycle asset. 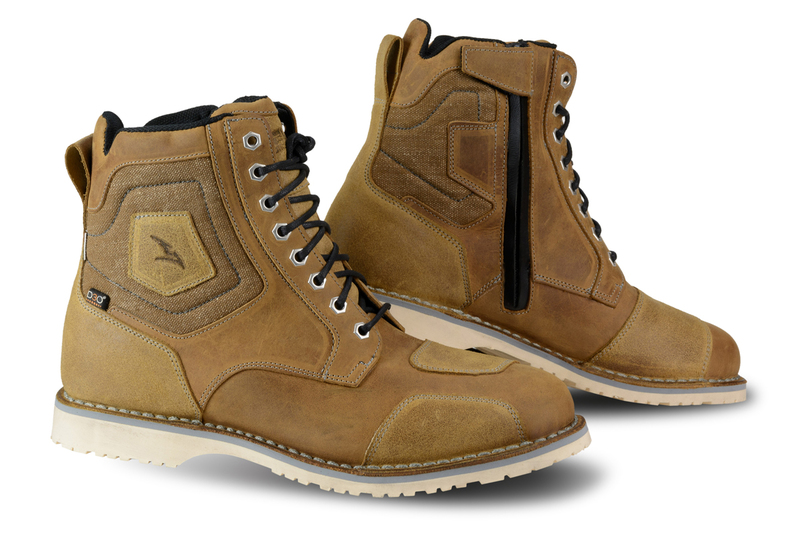 Conforming to CE European safety standards, and available in two different colours of Italian leather, The Ranger is a multi purpose men’s motorcycle boot with a modern and classy feel.